I guess I'm kind of backwards. Usually when people learn to sew they start with a quilt. Well, I've been sewing for about 2 years & I'm now just making my first quilt. For Christmas EVERY year I get my grandma knee highs. Maybe 10 years ago I bought my grandma something different for Xmas & she wasn't very happy, she said she doesn't buy them because she knows I get them for her for Christmas--so every year I get her knee highs. 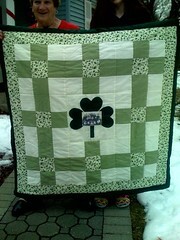 Well, this year I really wanted to make her something special & I thought a quilt would be just perfect. Me & my Aunt met at Joann Fabrics to pic out colors & ideas. The picture isn't close, the colors are sage, ivory, forest green & an ivy pattern fabric with an ivory back round. The middle block is an applique with a shamrock & the middle is a picture we did last year on Thanksgiving with all us grand kids & my grandparents in the middle. This was actually my 1st applique to--well, I've done appliques before but on my embroidery machine, big difference. Of course I waited until last minute & was still up at 2 am trying to finish-- I had to be up at my parents house for 10 am breakfast :). I am so hooked now, I can't wait to make another one! I have a "favorite" on flickr that I love! I really love how she use all solid colors. It's funny that something as simple as using only solid colors could look so beautiful. Today I might be going to Joann Fabric! Unfortunately it's about 40 minutes away from me so I don't get to go often--maybe that's a good thing because if it was close I'd be there all the time & I'd be spending $$ all the time. Today I'll be in that area so hopefully I'll be able to stop by. I'll be with Frank & he won't want to go but I'm sure gonna try! Wish me luck! I don't necessarily think that most people just learning to sew would start with a quilt. I think a lot of new sewists are intimidated by quilting. They tend to look so intricate and complex. I have been sewing since I was a young child, for conversations sake, let's say 30 years ago, and I never attempted a "real" quilt until about 3 years ago. I think you did a great job, especially considering the time contraints you were working under. ...and on to the next one!!! your blog made me think of that quilt, b/c it was made for my baby 2nd cousin who was born to my adult cousin Melissa who went to medical school in NY and lived in the Bronx for a few years. i wish she still lived there, as visiting her in South Beach is almost impossible for me now.